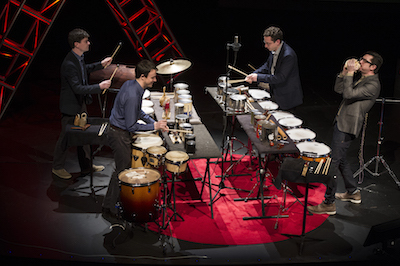 Hailed by The New Yorker as “vibrant” and “superb,” Chicago's Third Coast Percussion explores and expands the extraordinary sonic possibilities of the percussion repertoire, delivering exciting performances for audiences of all kinds. 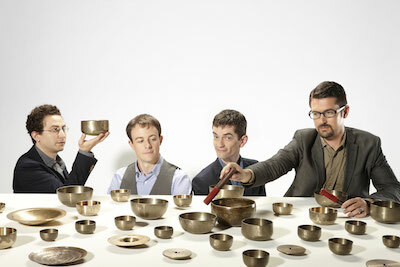 Formed in 2005, Third Coast Percussion has developed an international reputation with concerts and recordings of inspiring energy and subtle nuance. These “hard-grooving” musicians (New York Times) have become known for ground-breaking collaborations across a wide range of disciplines, including concerts and residency projects with engineers at the University of Notre Dame, architects at the Frank Lloyd Wright School of Architecture, astronomers at the Adler Planetarium, and more. Third Coast’s recent and upcoming concerts and residencies include the Metropolitan Museum of Art (NY), Museum of Contemporary Art (Chicago), Town Hall Seattle, Bravo! Vail Valley Music Festival (CO), Eastman Kilbourn Recital Series (NY), St. Paul Chamber Orchestra Liquid Music Series (MN), Atlas Performing Arts Center (DC), Ensemble Music Society of Indianapolis, National Gallery of Art (DC), University of Chicago Presents, and the Austin Chamber Music Festival. When Third Coast Percussion was here in 2012 they rocked Club Sudakoff, with works ranging from Reich’s intense and beautiful Mallet Music to Cage’s raucous Third Construction (which featured modified tom-toms called “lion’s roars” and rhythmic conch shell blowing). Their precision and control were matched only by their explosive energy. This year they will offer a program featuring a movement from Augusta Read Thomas’s acclaimed Resounding Earth, composed for bells from around the world; Glenn Kotche’s Wild Sound; and works by Owen Clayton Condon, Thierry De Mey, Isaac Schankler, and Third Coast’s own David Skidmore. Read a New York Times review of Third Coast Percussion's performance of Augusta Read Thomas's Resounding Earth in New York here, and watch a video of Glenn Kotche and TCP members talking about Wild Sound, just to the left. Instruments for our concert kindly supplied by Florida Percussion Service. Tickets are FREE for New College students, faculty, and staff—just bring your NCF ID to the concerts or click here for tickets and select "Faculty/Staff/Students" after you select the individual concert(s). For everyone else, single event tickets are $15, and season tickets to all five concerts are a bargain at $60. Click here to purchase tickets on line. Admission to all of our Artist Conversations, as well as the Student Composers Concert and the Electronic Music Concert, is free for everyone. Tickets for non-New College students in the community are $5 at the door with student ID. Visit our Reservations page for details. Our visiting artists are paid for in part by Sarasota County Tourist Development Tax revenues.